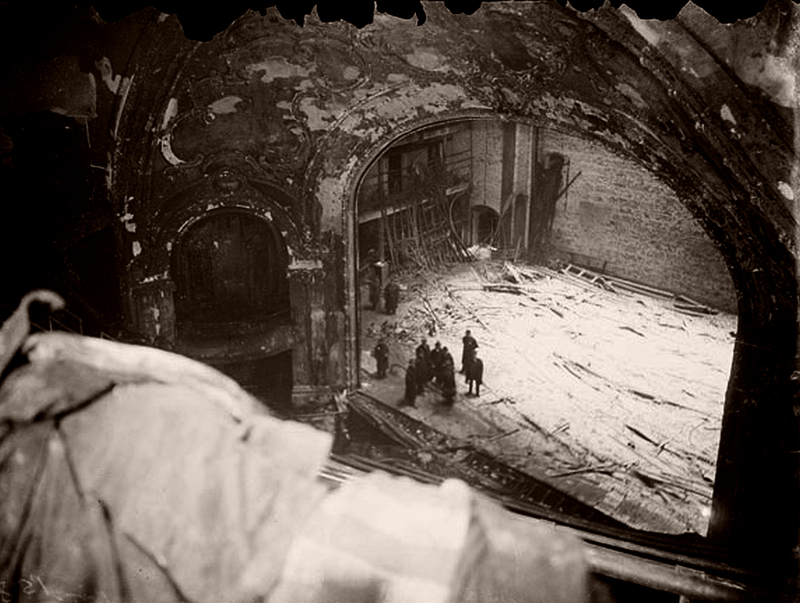 On December 30th, 1903, 602 people were killed in what remains the worst theatre fire in the US. 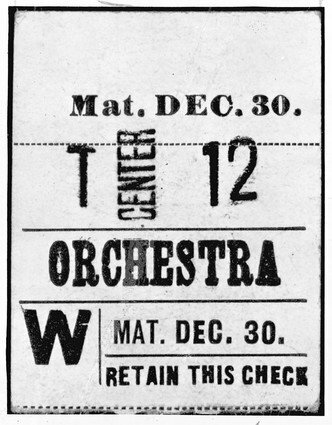 This tragedy occurred at the Iroquois Theatre, only 5 weeks old and boasting to be “fireproof”, in post “Great Fire” Chicago, the home of some of the most strict fire codes in the world, both then and now. Wooden planks, hastily hammered together by carpenters at work in a neighboring building in an attempt to save patrons from an uncompleted fire escape, visible over Couch Place alley. The 1,700 seat house was oversold for the matinee performance of the popular pantomime “Mr. Bluebeard,” starring Eddie Foy. An estimated 250 had taken advantage of the “standing room” tickets that were briskly sold by the box office staff, packing nearly 2,000 people into the new, and incomplete theatre. The performance was partway into its second act when a lighting fixture ignited drapery on the stage right side of the proscenium. An ineffective extinguishant was the only response available, so the fire quickly spread to the untreated and exceedingly flammable set. The fire curtain was brought in, only to snag on a lighting fixture hung in its path (it was later discovered that the fire curtain was not fire resistant, as it was consumed in the fire) Patrons were told not to exit at first, but many rushed to the doors they came in from, missing easier exits. Some exit doors were covered by drapes; some opened inward; some were “decorative” and not actually exits; some opened onto incomplete fire escapes (patrons fell or jumped to their deaths on the brick paved alley below, piling up to the point where their bodies created enough of a cushion to allow others to survive the fall); some were simply locked. In fact, the main doors between the lobby and the outside, where most people would try to exit, were all locked except one, in an attempt to keep people from sneaking in during the performance. All of the exits from the house were equipped with a new European style latch device that was unfamiliar to the general public in the United States. Many exits that did open were not wide enough to accommodate fleeing patrons. But the biggest problem that occurred was the result of the unfinished fire loft being nailed closed: so when stagehands and performers opened the stage door to escape, fresh air was supplied to the fire, which flashed over into the house (as there was no fire curtain to stop it, or open loft to chimney it) toward the open exit doors at the top of the balcony. Those that were not killed outright (some decapitated by the force) understandably panicked and joined in the push for the doors. Many were crushed or trampled, most were then killed by the smoke and fumes. When firefighters entered the theatre, an estimated 15 minutes after the fire had started, bodies of those who died at some of the exits were piled seven deep. Over 200 of those killed were young children. In some cases, entire families were killed. The majority of the deaths and injuries were of those in the balcony and gallery. While some new laws were enacted in the aftermath, most of the problems were the result of violations of the existing laws. Over 100 years later, have we really learned the lessons of that fateful day? Yes, we have new laws, new codes, new regulations, but do we follow them? How many theatres have exemptions to these laws, are “grandfathered in”, or simply ignore them altogether? How many times do we tempt fate, and risk lives? Fire curtain: automatic (hopefully) fire-proof barrier that closes off the stage space from the seating area in a proscenium theatre in the event of a fire. Despite this being one of the biggest reasons for the loss of life at the Iroquois, we continue to block the path of the fire curtain for many shows, or during load-ins or tech weeks, and in some cases, lock it off to prevent it from coming in (due to effects triggering the alarms during a show). Fire doors: fireproof doors that either automatically close when fire alarm is triggered, or remain closed except when a person is entering or exiting. We block these open without a second thought, because everyone else always blocks them open. What are the realistic chances of anyone remembering (or being able) to unblock all the doors in the event of a fire? Simply letting these doors shut (even when there is no audience) could prevent a small fire from becoming a large fire. Three of the four main lobby doors to the street had been locked to keep out people trying to sneak in. Other exits, like this one, were found to be too narrow. Fire exits: (usually with fire doors) an exit from the space clearly marked to be an unobstructed path out of the theatre/building. Where do I begin? We cover the EXIT signs, remove the lamps from the signs, block views of the signs, remove the signs themselves. If that was not enough, we block the exits with chairs, costume racks, props, even heavy or permanent set elements. We use the hallways of the exits for storage of all sorts of things, which an audience member isn’t going to know about until they hit this stuff in the dark. Do your exit doors have crash bars (as opposed to handles)? Crash bars are meant to unlatch a door with no more than the weight of a body falling against the crash bar (in fact, they were designed as a direct result of the Iroquois fire). If your emergency exit doors do not have crash bars, INSTALL THEM! If your emergency exit doors do have crash bars, do they work? I have seen doors that did not unlatch when the crash bar was pushed, which could result in a crushing situation in an emergency. MOST IMPORTANTLY: DO THEY OPEN OUT? What about the path from the outside door away from the theatre? Is it clear, or is it blocked by dumpsters, trash cans, cars, semi-trailers, or bushes? It is not enough to simply have the door: people have to be able to get away from the building. Fire extinguishers: portable tanks (usually pressurized) containing a substance capable of extinguishing a small fire. Rated by type of fire they are capable of extinguishing. Do you know where yours are? Are you using one to prop a door open? Do you have the right kind of extinguisher? You should have all ABC rated extinguishers, to ensure that you can put out any type of small fire. Do you know how to use them? Do you know when a fire is to big for you to extinguish? (if it is bigger than a wastepaper basket) Do you have enough of them, in all locations where they might be needed, and in places that are always accessible? Fire hoses: Full size fire hoses permanently installed in key locations and fed by city water supply or standpipe. These are for the use of the fire department only. They should not be blocked, covered, or otherwise made inaccessible to anyone. They are designed to be easily found by fire fighters and easily accessed. Why then to we block these incredibly important pieces of equipment with sets and curtains? Why do make it harder to put a fire out as quickly as possible? Automatic sprinklers: Devices that automatically open during a fire to spray water on the affected part of the building. These are constantly being painted over, which effectively seals them, and prevents them from releasing water. Set pieces are sometimes constructed, such as roofs or ceilings, that would block the sprinklers from reaching the stage. Fire escapes: Structure added to the outside of a building to allow persons to exit in the event of a fire. Have you had yours inspected lately? Is it still capable of holding the weight of the largest number of persons that could be on it at any time? Are the access points to it (doors, windows) blocked or locked in any way? For ladders or stairs that store above the ground and descend when someone is on them: do they operate with the weight of a person? Are they rusted in place? Do they have a clear landing point, or is it blocked with cars, dumpsters, or “temporary” storage of material? Emergency Stairs: Stairways inside the building intended for use in the event of an evacuation. Are doors to or from these stairs locked? They shouldn’t be. Are all the lights within the stairwell working? Are all the EXIT signs for the stairs working? Is there a clear, visually and physically unobstructed path to the stairs on every level? Is there anything stored in the stairwell? If so, GET IT OUT OF THERE! Fire lanes: Areas set aside to always be clear for emergency vehicles and equipment. Does your theatre use this space for parking? As a staging area during a load-in? Why do we complicate the work of fire fighters who would be coming to help us? Flame treatment (for scenery or costumes): means of rendering material fire-proof or flame resistant. Mandatory for all material used in a theatre. How many sets have you seen that you simply knew there was no possible way that it could have been treated? Fabric is the usual culprit, but some sets have even been made with newsprint. Its not hard to use, but it needs to be done, and done correctly. Would you trust every material used on your stage to a match test? UL rated electrical equipment: Rated by Underwriters Laboratories to be safe under conditions, when using accessories as recommended by the manufacturer. 1000 watt FEL lamps in Altman 360Q ellipsiodals were a major violation of this that used to see in nearly every theatre. 360Q’s are rated for 750 watts, not 1000. They are not designed for the heat or the power consumption of a 1000 watt lamp. This is just one example. How many times do we push our electrical equipment, cables, and connectors beyond their rated capacity? How many times has someone simply replaced a 15 amp breaker with a 20 or 30 amp breaker, without also ensuring that the wiring was capable of handling such loads? Are they trying to start an electrical fire, possibly in the walls? Nearly all of us have seen a standard 15 amp Edison connector being used to power 2000 watts (or more) of lighting. Plan of action and evacuation in the event of a fire. Does your theatre have one? Do you know if your theatre has one? Is it common knowledge? There is little chance that you will have time to pull it out and read it during a fire, so why not learn it now? Where should the audience gather after evacuating the building? Where do employees gather? What is the procedure for reporting a fire? Do you contact your security department (theatre, museum, school, building), or do you just call 911? Does the fire curtain need to be activated, or is it triggered automatically with the alarm? Are you sure that everyone you work with has read and understands the fire plan? View from downstage left of the Iroquois soon after the fire. Some patrons who remained in the front row were decapitated by the force of the flashover. Too often we think, assume, or are told that ______ is not our responsibility: that “someone” will take care of it. Well just who is that someone, and will they always be at the theatre, in the exact place they are needed, when a problem does occur? I, along with other members of the backstage staff, was told during a fire safety briefing at one theatre that I was “not required to assist” and “are not responsible for” the evacuation of the audience in the event of a fire during a show. The problem with this was that the ushers that were supposed to assist the audience were volunteers, and usually new to the theatre. It was rare to see them briefed on evacuation procedures, and hard to believe that they would know what to do and where to go in an emergency. I believe that every person involved with a production is responsible for the audience’s safety. They are our guests: we invited them in. We know the building, we know the exits, and we know the alternative exits if the main exits are blocked by people or a fire. How’s this for proof: Approximately 2000 patrons and 500 staff (cast and crew) were in the Iroquois at the time of the fire. Of the 602 killed, only 1 was from the staff, and she was an actress trapped in a flying rig above the stage. The cast and crew knew where the exits were and how to get out: they had been working at the theatre for weeks. The audience, who had never been in the building until that day, had to figure it out for themselves. I do lighting. As such I am responsible for installing dozens or hundreds of lighting instruments which get very hot and use a lot of power. Which means I am putting dozens or hundreds of potential starting points for a fire within the very space that dozens, hundreds, or thousands of people will occupy with the hope of being entertained. It is more likely that a fire within a theatre space will be started by lighting equipment than by any other source (and was the cause of the Iroquois fire). Because of this, I not only strive to ensure that the lighting equipment is not in a location or condition that could result in a fire; but I also am adamant that all other fire safety regulations be followed. I walk the space before and after each performance. I check that all exits are clear. I check that the fire curtain and all fire doors do not have anything preventing them from closing. I check that my worklights do not have a drape or rope in front of them if work has been done in the space that day. And I am able to assist any new crew member or stage manager with procedures and locations of alternative exits in the event of a fire. I do all this because: 1. I want to know it myself. 2. I understand that I might have missed something during my inspections. 3. I am willing to take that responsibility, even if no one else does. A fire can and will happen when you least expect it. I have been in 3 sizable theatre fires (meaning: spread from point of origin to additional material): 1 arson, 1 electrical, 1 caused by a forgotten worklight behind a drape. In addition, I have been witness to 2 electrical fires that were contained to the electrical device. In each case mistakes were made in the panic of the moment. Mistakes that had the fire grown bigger, could have resulted in serious damage or injury. The biggest mistakes were made during the biggest fire. As we mark the 114 year anniversary of this tragedy, I ask you to take the time to look around your theatre and see if you are truly doing everything you can to make it as safe as possible. Go through the list above to start. Take the time to check your emergency equipment. Walk your emergency exits. Look for potential problems. Sit in the house: can you see at least two exits, and signs, from all the seats? If you are unsure of what to look for, contact your local fire inspector and ask them to assist you. They will be happy to help. Better to fix the problems now than explain in court, or to a grieving family, why you did nothing. I frequently work at a theatre across the street from where the Iroquois stood (the Oriental Theatre stands there now). I sometimes walk the alley behind it. The alley was refurbished in the last few years, but for a while the old brick was visible where the pavement had worn away. While it was the only physical reminder from that tragic day, the mindset that allowed 602 people to die is still alive and well in all of our theatres. We must remember that a fire can, and eventually will, happen to us, and do all we can to prepare for it. Otherwise the Iroquois will be forgotten, when a new theatre, perhaps yours, takes its place. For more information on the Iroquois, I suggest you start here. ← North Shore Music Theatre fire: financial impact contributed to bankruptcy.